What happens when a little girl decides to set up a lemonade stand for peace outside the Westboro Baptist Church headquarters in Kansas? Members of the community step out in droves to show support, even as the hate group tries to quash it. 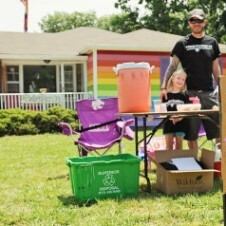 Five-year-old Jayden, the daughter of Jon Sink, founder of the philanthropic arts group FRESHCASSETTE – Creative Compassion, decided to set up a stand selling pink lemonade at The Equality House on Friday afternoon. The Equality House is a rainbow-colored building directly across the street from Westboro’s Topeka compound. The house, which was painted the colors of the pride flag in March, was bought by Aaron Jackson, one of the founders of Planting Peace, a multi-pronged nonprofit set up in 2004 and aimed at spreading goodwill and equality around the globe. Click here if you are interested in donating to Jayden’s Pink Lemonade Stand for Peace. Posted June 17th, 2013 & filed under Activism.